There's something about The Timekeeper that feels quintessentially Canadian. I can't quite put my finger on it, but maybe it's the "hey, no hard feelings" tone of the ending. Given what comes before - including murder and what is essentially slavery - it's an odd note to end on. Don't get me wrong, it's a good movie; it's just a little strange. 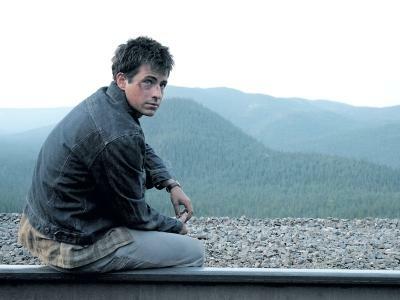 Set in the early 1960s, The Timekeeper follows the fortunes of Martin Bishop (Craig Olejnik), who heads to the Northwest Territories and takes a job working for a railroad that's being laid down. Martin will be taking over as timekeeper, keeping track of the number of hours the men work - or so he thinks. He's quickly informed by the foreman, Fisk (Stephen McHattie), that he's not expected to keep accurate time but simply to record the amount of time Fisk decides that the men deserve to be paid for. This means that they might work 17 hours but will only be given credit for 12, something which does not sit well with Martin. Nor does it sit well with him when he discovers that several men have been exiled from the camp and forced to fend for themselves in the woods, fighting for the food scraps the camp tosses away. Martin takes a stand against Fisk which results in him being tossed from the camp to join "the garbage eaters." Though initially hostile towards him - another exile means another person fighting for scant resources - the exiles, including the former timekeeper Grease (Julian Richings) and mildly psychotic Scully (Roy Dupuis), eventually join forces with him, first sabotaging the rail line and then making a break for it, trying to escape from the remote region where the camp is located and make it back to civilization. Escape, however, is futile because Fisk is determined to track them down, bring them back to camp, and punish them for their insubordination. The story is set up along the lines of a David and Goliath narrative, with the lone, brave crusader standing up against a seemingly insurmountable force of corruption, and there aren't a ton of surprises in terms of the way the plot develops (though there are a few). The cast, however, is very strong and their performances, and the clashes of personality that take place throughout the film, make it very compelling. As Martin, Olejnik manages to be earnest without being insufferable and McHattie makes for a great villain. Dupuis doesn't get much to do, but he manages nevertheless to make an impression. Directed by Louis Belanger, who co-wrote with Lorraine Dufour, The Timekeeper ends up being as much about the scenery as about the characters. Belanger explores the landscape from multiple angles, making it at once a place of freedom, cut off from the rules and laws of society, and the walls of a prison which keep the exiles under Fisk's thumb. The setting is at once a place of startling beauty and unspeakable savagery, the work being done there a signal of progress, but progress achieved through draconian means. Nature is at once Martin and Fisk and the film's exploration of this duality helps keep the tension high and the story moving along. I don't know that the film quite achieves what it sets out to, but it's still an interesting and very well-made endeavor. Hey is this based upon a book and if so, is the book based upon a true story?